A couple of weeks ago, I went to the opening for an exhibit entitled Angular and Architectural in downtown San Francisco. The title itself features elements that reappear in my own photography as well as my viewing and appreciation of art. Plus it was conveniently on the way home from work. 901 Market Street is one of those typical older office buildings one sees downtown (this building dates back to 1912). It is an imposing stone building, a bit heavy and a bit ornate. The inside, however, features an open modern atrium, very clean, full of light and space, and a perfect “canvas” for an art exhibition, particularly one whose theme is architecture and geometry. 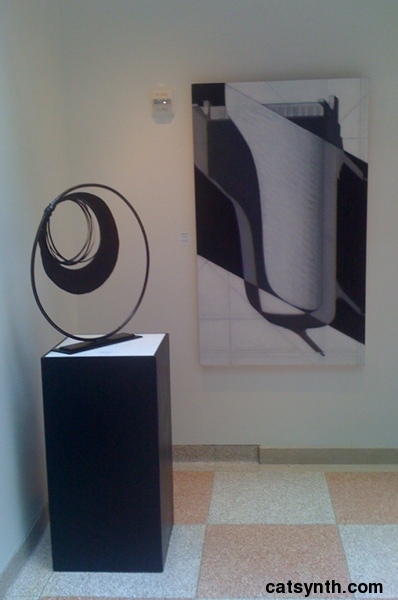 The black-and-white of the painting matches the dark color of the sculpture against the white background, along with the thick bands of black and gentle curves. 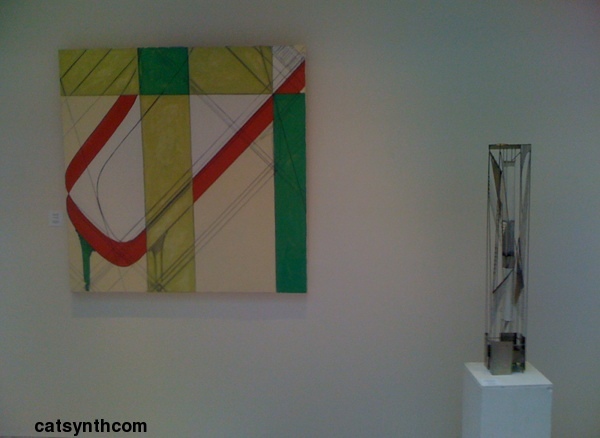 In this painting, the strong angles and thin lines in the painting match the sculpture, and both have a somewhat Art-Deco quality. 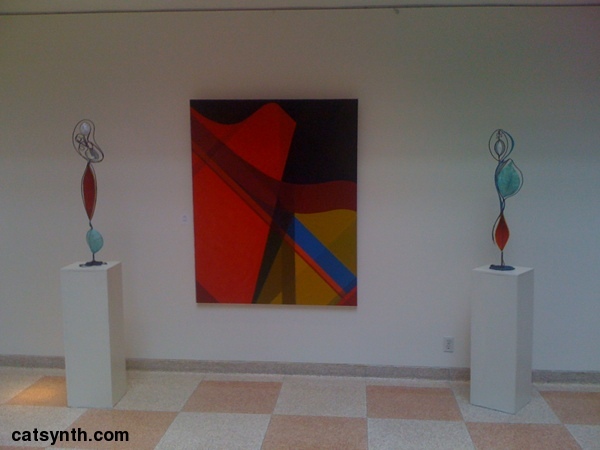 The curved shapes and bright red in the last painting bring up the red elements in the two sculptures to either side. This exhibit reminds us how the placement of disparate works in exhibition is itself a creative act, finding elements across artists and media that somehow work together.